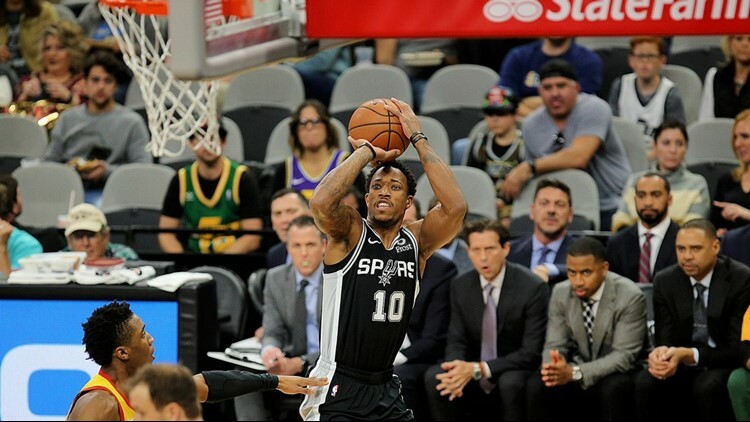 Spurs guard DeMar DeRozan, lining up a shot against the Jazz on Dec. 9 at the AT&T Center, had a team-high 35 points in Thursday night's loss to the Portland Trail Blazers. The Spurs are 0-3 since leaving San Antonio with a five-game winning streak. Spurs' last game: Lost to Trail Blazers 127-118, Thursday, Portland, Ore.
Spurs' injury/inactive report: Forward Rudy Gay (left ankle sprain), probable; forward Ben Moore (G League assignment), out; point guard Dejounte Murray (torn right anterior cruciate ligament), out; guard Lonnie Walker IV (sprained right ankle), out; point guard Derrick White (right heel soreness), doubtful. Jazz's injury/inactive report: Center Tony Bradley (right knee surgery), out; guard Dante Exum (left ankle sprain), out; forward Thabo Sefolosha (right mild hamstring strain), questionable. Notable: San Antonio is seventh in the Western Conference standings, trailing No. 6 Utah by percentage points . . . After playing the Jazz, the Spurs meet Memphis on Tuesday in their last game before the All-Star break. The Silver and Black will resume their eight-game rodeo trip at Toronto on Feb. 22, and end it with a back-to-back against the New York Knicks and Brooklyn Nets on Feb. 24-25 . . . San Antonio plays the Detroit Pistons in its next home game Feb. 27 . . . The Spurs have gone on an extended road trip each year since 2003 to make room at the AT&T Center for the San Antonio Stock Show & Rodeo, scheduled Feb. 7-24 this year . . . The Silver and Black are the only NBA team with an all-time winning record against every team in the league. They lead the series against the Jazz 105-82. Taking in water and listing after starting their annual rodeo road trip 0-3 for the first time in the 17-year history of the trek, the Spurs face the challenge of trying to bounce back in a city where they have played one of their worst games of the season. The Utah Jazz routed the Silver and Black 134-105 on Dec. 4 in Salt Lake City, setting a season high in field-goal percentage (60.7) after hitting 51 of 84 shots. Utah also set a franchise record for three-pointers made, knocking down 20 of 33 attempts for 60.6 percent. San Antonio beat Utah 110-97 five days later at the AT&T Center to even the season series. The Spurs (32-25) must beat the Jazz (31-24) on Saturday to keep alive their slim hopes of finishing the eight-game rodeo trip with a winning record, as they have 14 of the previous 16 seasons. San Antonio had won five straight before starting its extended trip with a 127-112 loss to Sacramento on Monday. Defeats to reigning league champion Golden State and Portland by respective scores of 141-102 and 127-118 on Wednesday and Thursday followed, adding to the troubles of a Spurs team that has been without steady starting point guard Derrick White the past three games. The Silver and Black coughed up 18 turnovers in each of the losses to Golden State and Portland, and their defense has been poor in all three games of the rodeo trip. They have yielded averages of 59.3 points in the paint and 34.3 on fast breaks, last among all NBA teams in both categories during the three-game span. Trailing Portland by 21 in the third quarter Thursday night, the Spurs went on a 25-4 run to tie the game at 88 with two minutes left in the period. But the Blazers, who were led by guards CJ McCollum and Damian Lillard, led 96-90 after three quarters and never trailed in the final period. 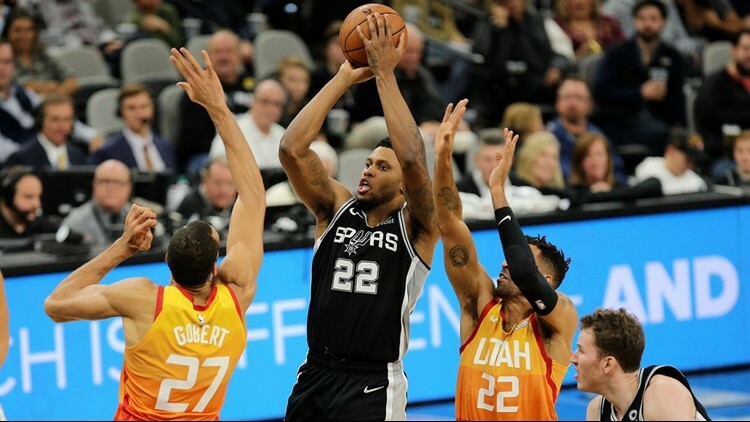 Spurs forward Rudy Gay scored 23 points and matched his career high with 15 rebounds in a 110-97 win over the Jazz on Dec. 9 at the AT&T Center. “Who knows, 18 turnovers are 18 turnovers, no matter how you slice it,” Spurs coach Gregg Popovich said. “Did a good job hanging in there, got down by 18 or 20 and they showed a lot of grit to get back in the game, but after that McCollum was just too tough. DeMar DeRozan led the Spurs with 35 points and Rudy Gay, who fueled the third-quarter rally with 16 points, added 25. He nailed 6 of 7 three-pointers. LaMarcus Aldridge had another double-double, finishing with 17 points and 10 rebounds. But Aldridge scored only four points in the second half. The Spurs had no trouble scoring, shooting 52.7 overall (48-91) and 57.1 percent (12-21) from beyond the arc. What did them in were their defense and, of course, the 18 turnovers. Portland shot 53.8 percent (49-91) from the field and made 11 of 31 three-pointers (35.5 percent). “It’s tough,” Gay said. “I mean, obviously we’ve had some tough losses on games we thought we should’ve won but, you know, it’s a long season. This is a learning experience for us, I guess we were at home and we were on a high and I guess we thought we would come on the road and play the same kind of game, but we have to change it up. McCollum scored 30 points and buried 7 of 13 three-pointers. He also had a team-high nine rebounds. Lillard finished with 24 points and nine assists and center Jusuf Nurkic had 22 points. San Antonio led 34-31 after one quarter, but was outscored 39-23 in the second to trail 70-57 at the half. After facing Utah, the Spurs play Memphis in their last game before the All-Star break. San Antonio won’t play at home again until taking on Detroit on Feb. 27.